We are organized to carry out the mission of the church which is to build the body of Christ, by nurturing, teaching, and caring for the children, youth and young adults, any in need within the church family and throughout the community. The WMS, which meets the first Saturday of every month, is open to all who are interested in learning about and participating in the mission of the church. 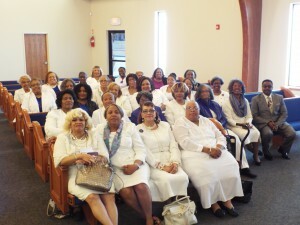 In 2011 we added The Gladys Goosby- Sedonia Walker GGSW Circle: – Vanguards in the Faith which is made up of median- aged women eager to serve and support. We would like to continue to expand our membership – to working women, recently retired women, new-in-town women, young mothers, and our young women in college. Circles can meet any time – anywhere and have a different focus but all emphasize study and service. All you need to do is bring your interest!